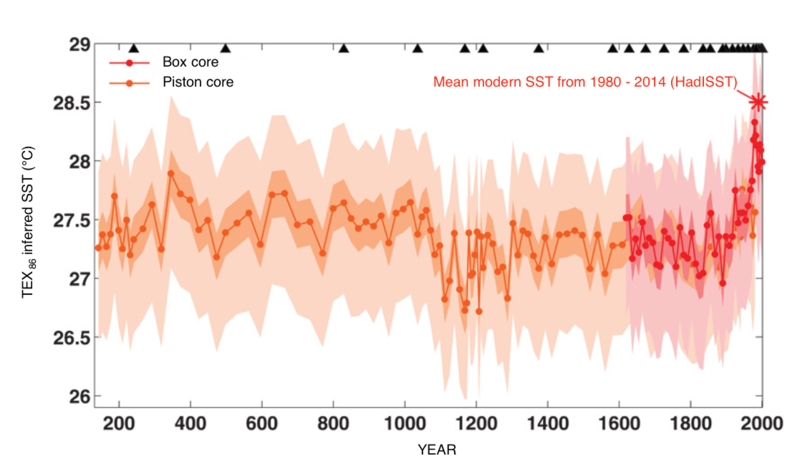 This graph shows historical sea surface temperatures based on TEX86, a paleothermometer, or method for determining past temperatures using a proxy found in the natural record. TEX86 is based upon the membrane lipids of single-celled marine microorgnaisms, called Thaumarchaeota, that grow best in moderate temperatures. Data is drawn from sediment samples using a box corer, a sampling device used to collect large amounts of sediment, and a piston corer. The piston corer is a long, heavy tube plunged into the seafloor to extract samples of mud sediment up to 90 feet in length.